You can not only assign clients to a particular work order type, but also assign work order types to a particular client. This can save you a great deal of time when, for example, you need to reassign a certain client from old work order types to new ones. On the Clients page, in the Action column, point to the Select button next to the appropriate client, and then click WO Types. 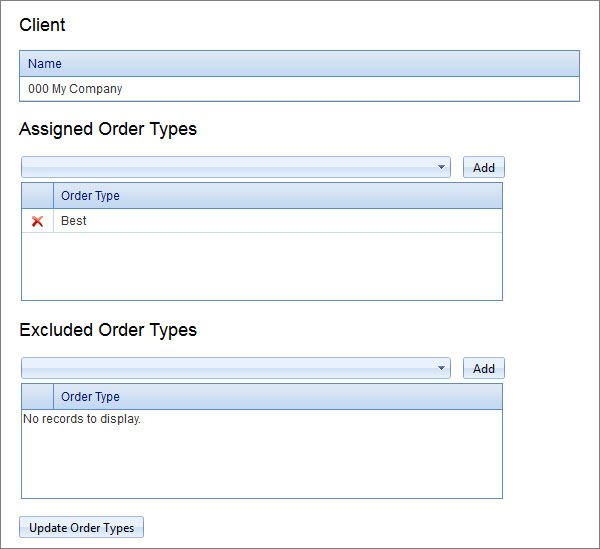 On the Client page, add work order types to the Assigned Order Types box to specify which work order types will be available for the given client, or add clients to the Excluded Order Types box to specify which work order types will not be available for the given client, and then click the Update Order Types button.